A close-up look at the landing legs on a private SpaceX Falcon 9 rocket launching from Cape Canaveral Air Force Station, Fla., on April 14, 2014. The Falcon 9 rocket will launch a Dragon cargo ship to the International Space Station, then attempt to return its first stage to Earth in a reusable rocket technology demonstration. 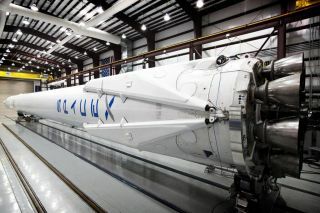 SpaceX has pushed back a commercial satellite launch from Saturday (May 10) until the end of the month at the earliest. "A static fire test in advance of SpaceX’s ORBCOMM OG2 Mission 1 was scrubbed this morning during fueling," SpaceX representatives wrote in a statement Friday (May 9). "Both the Falcon 9 rocket and ORBCOMM satellites are in good condition, but as a result of schedule constraints, launch will be postponed past this weekend with the next opportunity most likely in late May." The mission, which was scheduled to blast off from Florida's Cape Canaveral Air Force Station on Saturday morning, will deliver six spacecraft to low-Earth orbit for the satellite-communications provider ORBCOMM. The OG2 satellites (whose name is short for "ORBCOMM Generation 2") will provide an upgrade over ORBCOMM's current OG1 constellation, company representatives said. SpaceX will launch a total of 17 OG2 craft using the Falcon 9, with Mission 1 lofting the first six in the new constellation. The last Falcon 9 liftoff, which took place last month, sent SpaceX's unmanned Dragon capsule streaking toward the International Space Station on a cargo mission for NASA. That launch also featured a successful rocket-reusability test, with SpaceX managing to bring the Falcon 9's first stage back to Earth in a soft ocean splashdown. SpaceX representatives have said they will attempt another first-stage recovery during the OG2 launch.